Singapore Airlines have always been our pride, having won several awards and known to be one of the world’s best airlines. 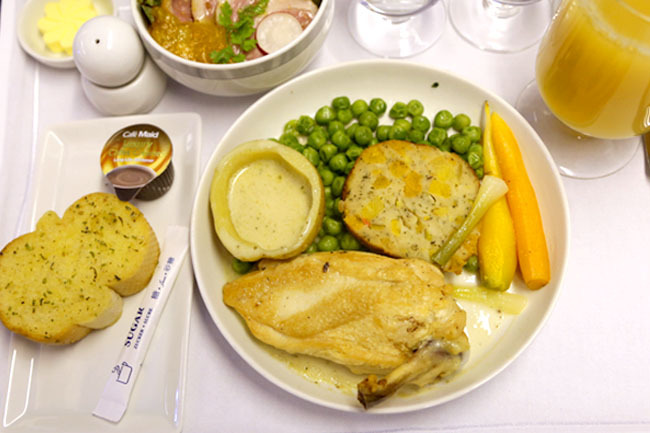 While some may complain about the drop of quality in food and service over the years, especially in the economy class, the taste is still a mile above (pun not intended) some of the other airlines. In terms of culinary offerings, the meals for SQ’s Business Class are really one of the best (some of the other airlines’ food is really not palatable). 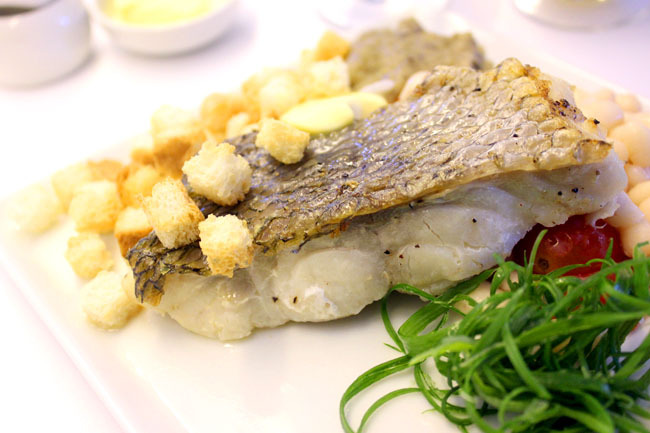 If you have not travelled in first or business class before, and are thinking about investing your money or miles in that ticket, here are some food features to expect. The best food service to me is the “Book the Cook” option which allows you to order the main course at least 24 hours before flight departure. Yes, it makes you feel unique and special, because only you would have the meal (unless another person coincidentally orders it). So no more “chicken or fish?” question. Some of the specialities are created by their International Culinary Pane, including chefs Alfred Portale, Georges Blanc, Matthew James Moran, Sanjeev Kapoor, Suzanne Goin, Yoshihiro, Zhu Jun and Singapore’s very own Sam Leong. 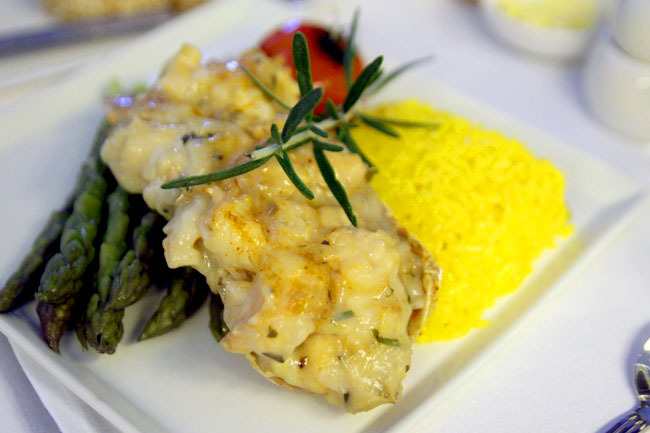 Of which, one of my favourite would be the Boston Lobster Thermidor, with juice lobster tail sautéed in butter, flambéed in brandy, sprinkled with cheese, and served with creamy mushroom sauce, garlic and spicy mustard, and buttered asparagus – a luxurious and rich tasting dish. Perhaps I am bias towards the Asian palate, given a choice of 3 to 4 items of its fixed menu, the Asian selection generally fare better than the European flight cuisine – which can taste quite one dimensional. One of my most memorable Business Class meals is the flight from Singapore to Tokyo, when you can experience the “Hanakoireki”. This is an elaborately pretty and delicately sumptuous meal which has an delectable spread which included cold dishes such as Kuchitori (vegetable appetisers), Mukozuke (seasonal sashimi) and a variety of dishes such as Yakimono (grilled dish) and Takiawase (simmered dish), complemented with rice, miso soup and a seasonal dessert. 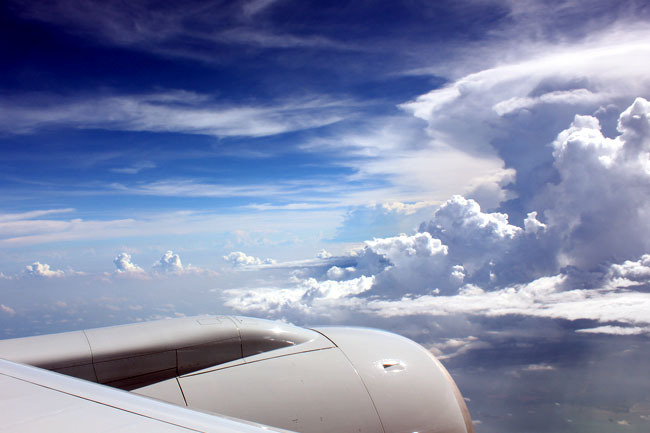 The “Hanakoireki” is available on selected flights between Singapore and Tokyo, Nagoya, Osaka and Fukuoka, and between Tokyo and Los Angeles. Some of my friends who wish to experience Business Class for the first time, would usually choose the Singapore to Bangkok leg. Only because it is not too expensive, with about 2 hours to enjoy that posh experience. With that said, I generally find the long haul experience a lot better than the short flights. During my last Bangkok to Singapore trip, the service crew wasn’t exactly the friendliest. In fact it was a senior steward who sounded possibly condescending, and another stewardess rather snappy. This may be acceptable in another airline, but we are expecting much more from SQ. The recommended meal of Roasted Chicken Breast with Pistachio Sausage and Green Peas, turned up to be a boring choice. Okay, when in doubt, pick Asian. It may sound strange, but I prefer picking local selections when given the choice, because I would like to see SQ’s interpretation and how they present our best to the world out there. 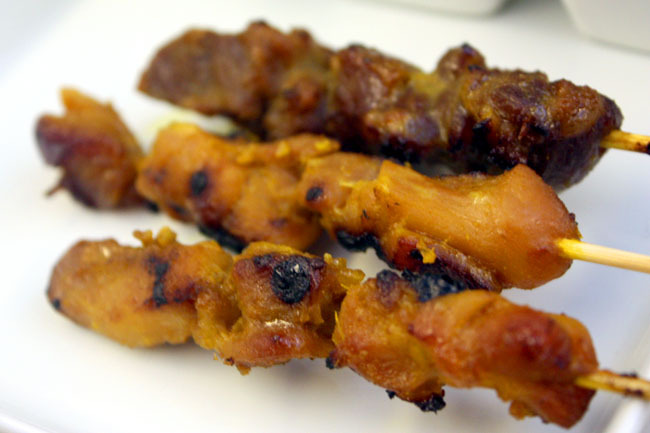 So far the popular Singapore style Chicken and Lamb Satay seldom disappoints, except with an occasional dry meat, especially its spicy sweet peanut sauce. 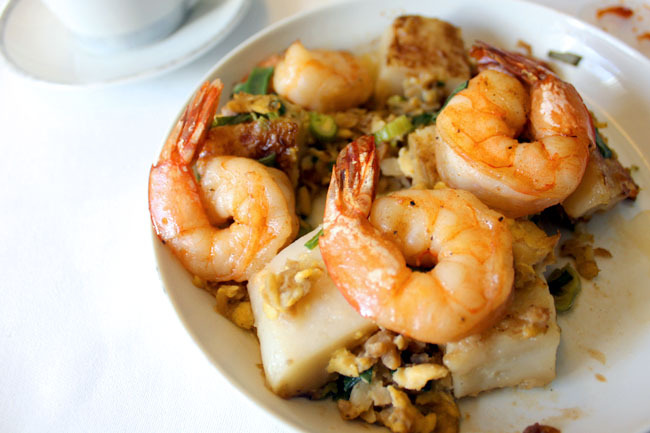 The Fried Carrot Cake with Preserved Radish and Prawns is easily my favourite dish in all the meals I had on board. 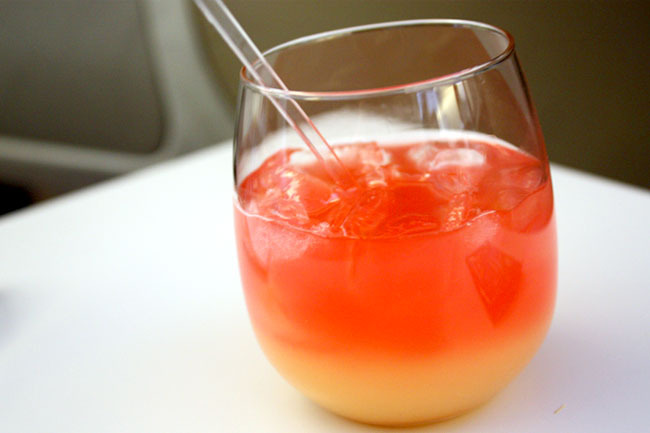 Oh yes, the drinks. Get the Mimosa, part champagne part orange juice (this is not available on the menu, but the SQ girls will know), or the Golden Spice, a refreshing drink of lime cordial with ginger ale and fresh pineapple juice. 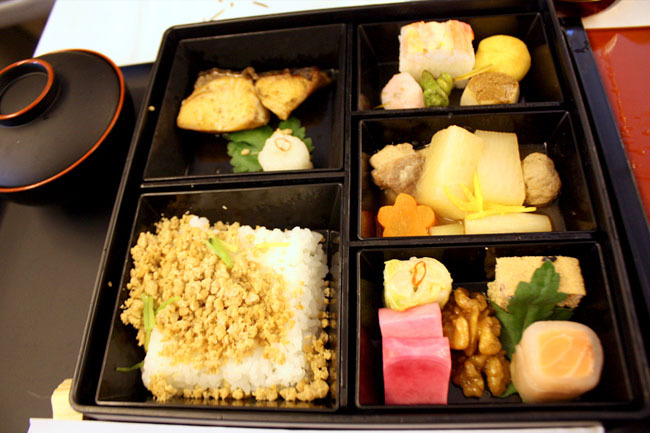 If you really want to indulge and pamper yourself in a Singapore Airlines Business Class, the Singapore to Tokyo flight is the most unforgettable, both for its impeccable service and elaborate food presentation. * Singapore Airlines did not sponsor me in any of these meals. This review is compiled from various trips of traveling on SQ Business class, mainly for corporate trips. * Totally irrelevant, but if you want to shoot food photos on the plane. You have to a) get the window seat b) book daytime flights when you know meals are served during the day. Totally agree that the Asian choices are usually better than the Western ones, and I love that square puff pastry-ish thing from the breadbasket, and their satay is really quite decent, isn’t it? But we haven’t really liked the Book The Cook options we’ve tried so far. I really like their Kyo-Kaiseki so I’m sure the Hanakoireki is really good as well. I usually take the garlic bread for bread basket, personal preference. Do get the Lobster Thermidor if you are Booking The Cook! OMG, didn’t know about the Booking The Cook option! Will def get the Lobster next time. Honestly, I find the food options on SQ Biz Class quite a hit and miss. But I remember having very delicious Nasi Lemak on one of the flights. i agree, the local options are always better than the western options – i personally always go for the soup options. Try first class someday. 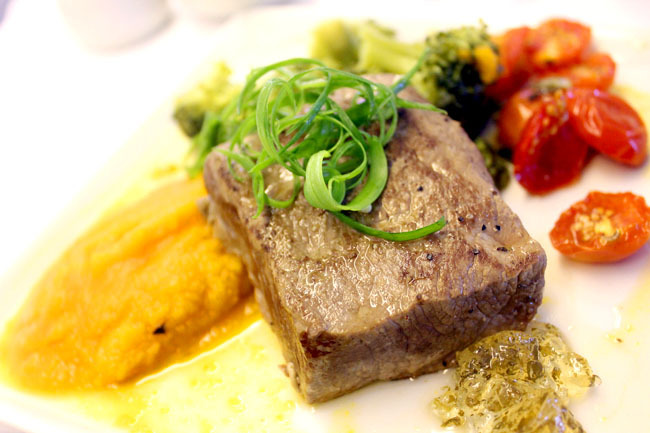 The food is absolutely phenomenal and is significantly better than Business class offerings. the lobster salad (they always have a lobster option) option is always outstanding. PLUS they have the most amazing breakfast options ever – one of the best bak kut teh i’ve had was on SQ. To me, the first class food was not that much better than biz class (considering how much much much more is paid). Agree the lobster was very yummy. Service was top-notch though – they really serve you like royalty. Haha. 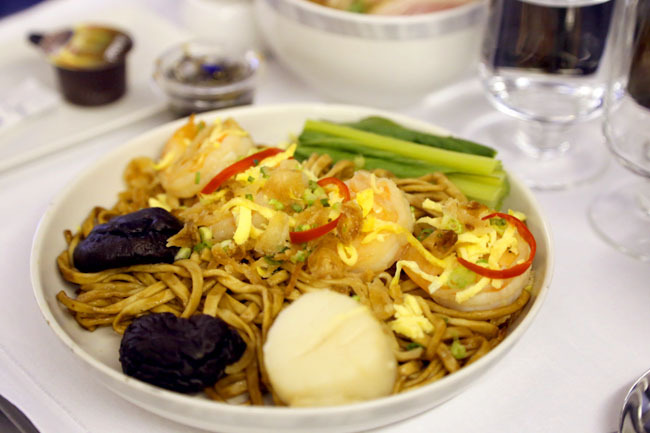 Food is usually something to look forward to on Singapore Airlines segments. However I had some flights in Singapore Airlines First Class that had barely edible food – what a disappointment! Sometimes I think it is a manner of choices. I agree. Not everything on First Class tasted that good.